Today's inspiration challenge comes from Room Service Home. I chose the stamp set pictured as my inspiration piece. 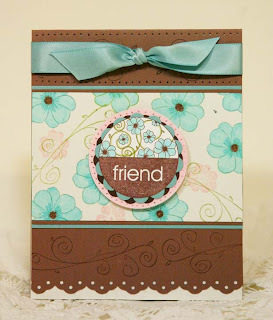 True Friend flower/emblem was stamped in Pretty In Pink and Sage Shadow on Whisper White. Label Classics tag stamped with Sincere Salutations sentiment. Today's challenge was to create your own designer paper using one stamp set. I chose Simple Friendship with Cocoa, Baja, and Naturals White. The Frugal Finds challenge on SCS was to find some old somethings you have around the house to recycle. Have I got some junk here, I can't seem to part with anything. I found these casters that were from some older furniture we no longer even have and some flat magnets I got in the mail with advertising on it. I used some double sided adhesive sheets, cut to fit caster frame and lightly sprinkled with Dazzling Diamonds. (These sheets are from Close To My Heart). The swirly image was stamped in Kiwi Kiss ink on retired Cool Caribbean. Stick sheet to it, and then to caster. This is what some of the finished magnets look like. 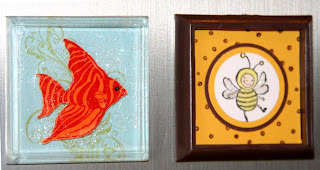 I used Ocean Commotion for the fish and Just Buzzin' By with Chocolate Chip and Summer Sun. I'll be back later with some more pictures, I'm getting evicted from my craft room for a while due to some construction we have going on. I just got the new set Simple Friendship yesterday and I think I'm going to love every stamp in this 7 piece set!! 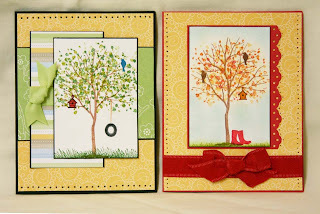 I used the Bella Birds paper with Cocoa and Naturals White cardstock. Small flower was stamped in Pirouette Pink with rhinestone brad added to center. 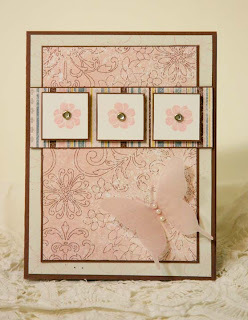 Butterfly was stamped in Pretty In Pink on vellum and cut out. Chrissy's Belli Challenge this week was to use a monogram. 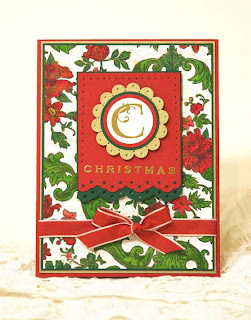 I used the Stampin' Up Lovely Letters set embossed in gold with Riding Hood Red, Handsome Hunter, and Whisper White cardstocks. I stamped the Bella Toile and then colored it in with Copic markers. I stamped a musical score (Stampendous) in Encore gold ink over top the Bella Toile. Finished off with some Riding Hood Red taffeta ribbon. Color challenge choices today were Kiwi Kiss, Pumpkin Pie, and Summer Sun. 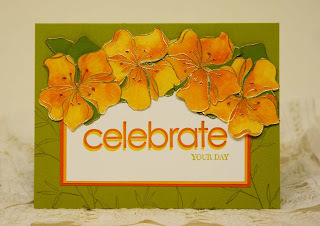 I double stamped the Celebrate sentiment, in each Summer Sun and Pumpkin Pie (shadow stamping). I embossed the Embrace Life flower in gold and colored in with markers and re-inkers, cut them out and mounted them with some leaves from Old Olive cardstock. 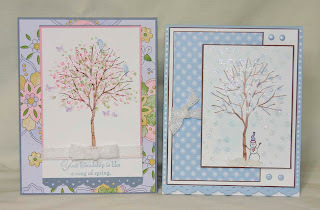 Our Three Amigas Weekly Challenge is hosted this week by Sharon Graham who has challenged us to use vellum on our card. We would love to have you join us for the challenge, just break out that vellum and add it to your card somewhere. Be sure to add TAWC to your keywords so we can see your creation and leave you some love. 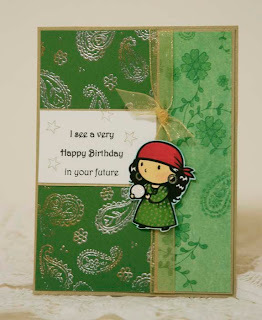 I chose this card of Jami's for my inspiration for today's Featured Stamper challenge on SCS. I changed the stamps, shape, and d.p. I made my own designer paper with the Paisley background stamp on Bashful Blue, stamped in Chocolate Chip and highlighted with white gel pen. I know I have this exact d.p. somewhere, but I couldn't find it. Brown satin ribbon and Pretties Kit pearls, Brocade Blue was run through Flowers Borders Cuttlebug folder. Think Big stamp set is from Artful INKables, the girl was colored with Copic markers and sentiment stamped in chocolate chip ink. 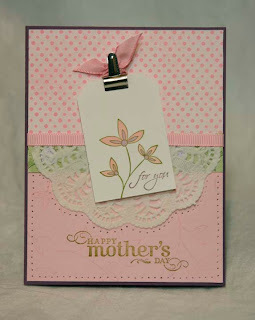 I used the Friends 24-7 set, lined the flourish up with the stamp-a-majig and stamped repeatedly in More Mustard. 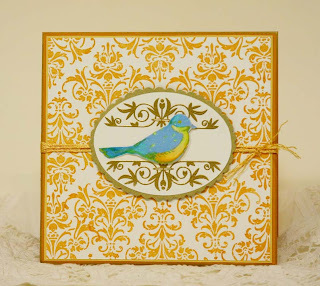 Frames With A Flourish embossed in gold with cut out bird in center. DNC gold embroidery floss tied in center. Edges of card outlined with Zig painty pen. 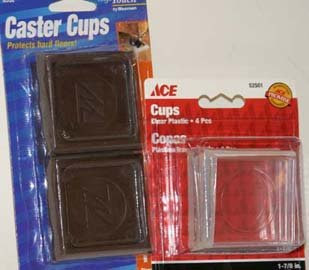 Very limited supplies today with ribbon and eyelet punch only for today's Limited Supplies/Go Green challenge. I used this cute bunnies designer paper by Best Creations and colored in Serene Spring with Copic markers for today's green challenge. Limited Supplies 208 to use green and no more than 2 embellishments. Our Doubledog Dare Challenge (DDC) this week hosted by Julia (artystamper) to use this image. I couldn't decide whether to emboss the Paisley in gold or silver, so I used both. Paper strip on side is from crafty Secrets and sentiment computer generated. Today's card is a combination of two challenges, the first is the WT to use stripes and the second is a weekly challenge this week hosted by Julie Alberda. Julie made up this sweet sketch for our TAWC or Three Amigas Weekly Challenge. We would love it if you would play along too, just add TAWC to your keywords. 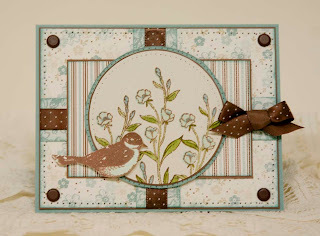 I used the SU Parisian Breeze designer paper with some Cocoa and Baja Breeze cardstocks, Friends 24-7 stamp set, 5/16" Neutrals assortment brads, and Valet ribbon. 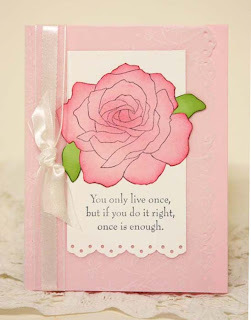 This is from the new Artful INKables set Think Big. I love this image, the little reading girl has the sweetest expression. I colored her in Copic markers and added dots to mimic the designer paper (Delicate Dots- new SAB). Today's Belli Challenge hosted by Chrissy Dickinson was to use inchies. 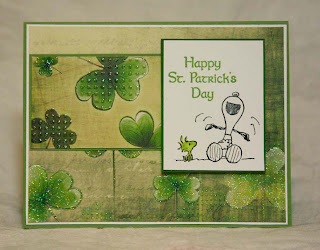 I used a little leprechaun stamp by Sonlight Impressions colored in markers, layered with Garden Green, Brushed Gold, and Whisper White cardstocks. 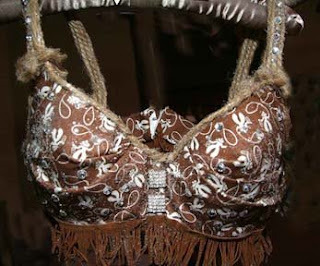 Tied with stretchy gold cord. 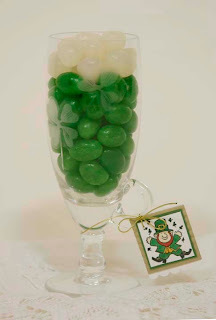 Glass was etched white shamrocks on it, I filled with green and white jelly beans to look like St. Patty's Day beer. I will seal this with plastic wrap and a round bit of lace and some ribbon to give as gifts. 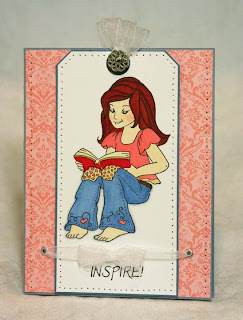 New today at Artful INKables this is the beautiful set called "Think Big" a set of 6 stamps that include three sentiments, this adorable girl reading, a stack of books and a cat. Perfect for the book lover! I colored the image with Copic markers and made this into a bookmark that easily slides right out from under the organdy ribbon secured with eyelets. This second set is called Birthday Best, a set of 10, perfect for any birthday celebration. Included here are a big, beautiful cake, two sizes of cupcakes, and a nice assortment of sentiments. 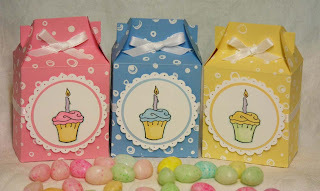 I made little treat favor boxes filled with candy. Cupcake images were colored in markers. For the treat boxes I used a retired sheet of SU's boxes and tags. I'll be back in a little while with some links to some beautiful cards and projects made by the INK girls with the new sets out today! Hope you will check out all of the new stamp sets released at Artful INKables! They are really fabulous! 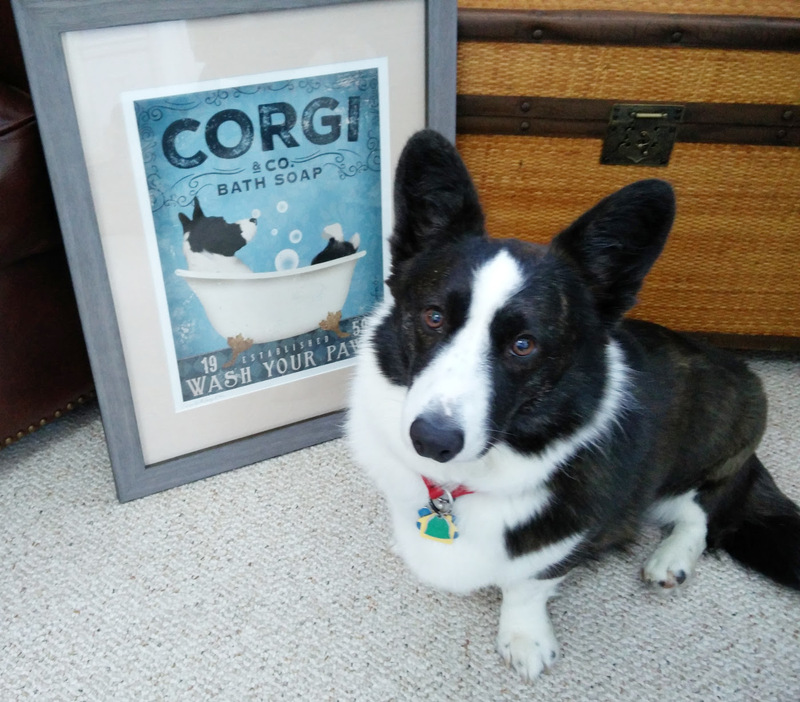 Please be sure to hop on over to Joy's blog to see what she has created! 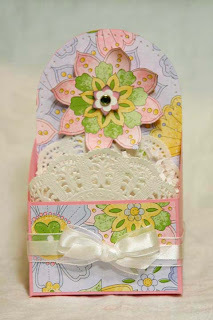 This was for today's Featured Stamper challenge honoring Julie Lacey on SCS. 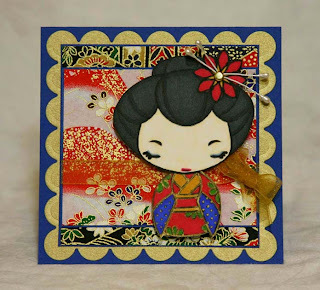 I chose her Geisha Anya to case, changing the scallop to a square and using different papers and colors. The chiyogami paper is by Hanko Designs with Brilliant Blue and Brushed Gold. Anya image is colored in Copic markers and highlighted with a gold Zig painty pen. Her hair adornment is a gold brad and I don't know what you call these pearl picks, you can find them in the wedding/floral department at Michael's or any craft store. I remember this story my Dad told about the time he totally forgot to get a card for my Mom for Valentine’s Day. He worked two jobs and there were six of us kids to take care of so it’s pretty easy to see how it may have slipped his mind. All day Mom happily anticipated him coming in the door with a Hallmark Valentine and maybe a box of Whitman chocolates. She was so disappointed when Dad came in empty handed. “Oh Reds, how could you forget Valentine’s Day” she said. After dinner Dad disappeared for a while. He came up to her with a card that he made himself. Mom smiled, she was so surprised at what a good artist Dad was. We didn’t know he could draw that well! 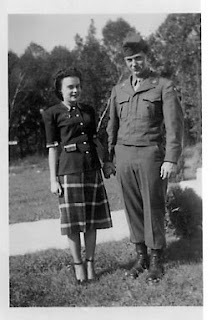 Mom passed away about 11 years ago. When my Dad was going through her things he found that valentine carefully wrapped and saved all of those years. That meant more to her than anything that could have come from a store. It was made just for her and from the heart. What could be better than that? Confetti Tan, Whisper White and Chocolate Chip cardstock embossed with white and It's Beautiful jumbo wheel. 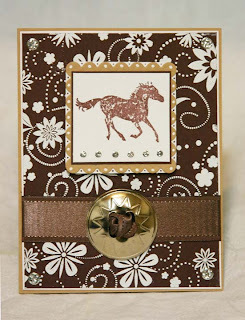 Chocolate satin ribbon and cowboy buckle embellishment used with rhinestone stickers. Wanted horse stamped in Chocolate Chip. I combined this with today's Limited Supply Challenge which was to make a card that is slightly different than how you would normally approach it. I really wanted to do more coloring and shading on the main image, but only colored in the bird. I kept it embellishment free which was really hard for me, and I reached for a set that I haven't used in at least a year. An added bonus is that it is a flat card and will not require extra postage! I have always loved Snoopy, ever since I was a little kid. I have quite a collection of Snoopy stamps (and other collectibles) because he just makes me happy. Peanuts was an all time favorite comic of mine along with The Family Circus, Calvin & Hobbes, and the Farside Gallery. When I was a little girl I wanted to be Brenda Starr when I grew up. Summer: Basic Black card base with Delicate Dots paper and new Celery ribbon from bundle in Sale-A-Bration. 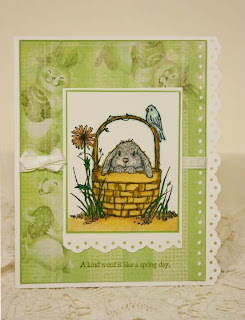 Grass stamp (Stampscapes) in Garden Green, leaves in celery, olive, and Garden green. Autumn:Ruby Red with Delicate Dots d.p. Edging done with eyelet punch, new Dress Up red ribbon. Leaves in Rust, Apricot, and Ruby. Birds in Chocolate and boots in Real Red. Shading done with chalk pastels. Spring:Bordering Blue card base with Tea Party paper and Dress Up ribbon. Leaves in celery and also embossed with retired pink powder. Birds in Bashful Blue, butterflies in Amethyst and Pretty In Pink. Sentiment is from Spring Song. Winter:Bashful Blue, Close To Cocoa, and Whisper White used with Delicate Dots paper, Dress Up ribbon and Soft Subtles brads. Tree in Cocoa, snowflakes in blue and some embossed with Iridescent Ice. Snowman is from The World Over (retired), snow is heated up Liquid Applique. Edged with eyelet border punch. When I randomly opened my brand new catalog this set was the first one I saw. I let out a little squeak of delight and knew this was going on my first order. 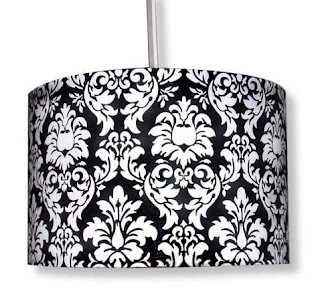 It's worth getting just for the fab flourish! 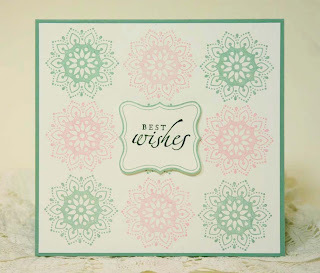 Delicate Dots designer paper was used along with Whisper White, Cameo Coral, and Bashful Blue. I clear embossed the swirl on the blue, the sea life was embossed using clear powder and Blush Blossom and Certainly Celery craft inks. I sponged in addition color with coral for the fish snd one seahorse and blue for the other seahorse. I added some eyelet "bubbles" and white gel pen dots. 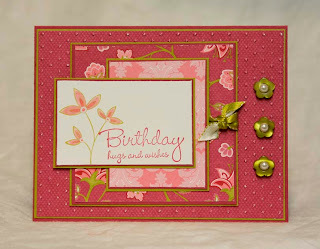 Card base is Perfect Plum, Pirouette Pink stamped with Sweet Stems and dry embossed with Texturz polka dot folder. Tea Party paper at top. I added a lot of edge piercing because I just can't help myself. This is also for a Belli challenge by Chris Dickinson to use a doily on your card. Flower stamped in Old Olive and colored with markers. Tag corner punch used with a clip and pink taffeta ribbon. I tried to see how many new goodies (shown with *)I could use on today's card. The *Branch Out set* was stamped with Caramel and Chocolate, leaves in Apricot, Celery, and Pumpkin. After stamping I ran it through the Big Shot using one of the new *textures embossing plates*. It looks really cool close up and kind of hard to distinguish it in the photo. 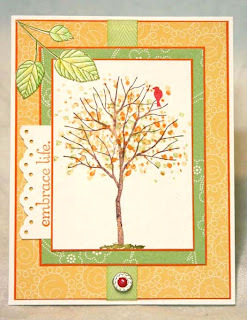 Embrace Life sentiment in pumpkin with *eyelet border punch* SAB *Delicate Dots designer paper* was used with Pumpkin Pie and Whisper White cardstocks. *SAB ribbon bundle in celery*. Embellishment was made with a decorative silver brad and a Real Red brad adhered to it (I cut off the prongs. )The cut out branch is from *God's Beauty level 1 hostess set*. Oh, how I love new stuff!! This is for today's technique lover's challenge on SCS to cut it out! and Julee's Mojo Monday 73 challenge. For the background I stamped the brocade style image stamp from the new Stampin' Up Friends 24-7 set in Versamark and then embossed it in white repeatedly to create the background. This took a bit since I had to re-position the image with the stamp-a-majig after each individual image embossing. I love the way the background came out though! The rest of the card was a snap after that. I stamped this same image in black on Whisper White, added sentiment in Real Red with a rhinestone brad from the Pretties Kit and some of the new Valet ribbon. This is SO pretty in real life. It is a ruched black velvet, it's a shame you can't see the detail of it in the photograph. This 3 pack of ribbon is a must have! Please join us for this challenge. We call it the Three Amigas Weekly Challenge or TAWC so make sure you use the TAWC so we can find your cards in the SCS gallery. Have a wonderful stamping week, y'all! I love this new set, it is very Martha-kicked up a notch. I love the versatility of these stamps, you can either go elegant or all natural. Can't wait to experiment! 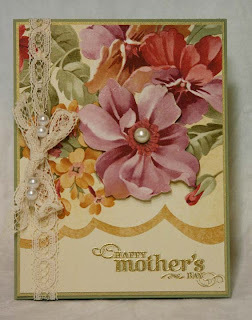 This card was for today's SCS Inspiration challenge. I used Baja Breeze, Chocolate Chip, and Whisper White cardstocks. I almost always use the Whisper White when I will be coloring. I have yet to find anything that works as well as this and I've tried quite a lot of them. I stamped the branches in Chocolate and colored them with markers. Bird was stamped in Baja and then cut out and placed on the flower branch. The yummy ribbon is the new Valet that comes with 3 in the pack; a chocolate satin pin dot a ruched black velvety one and this Baja satin. ooo, purty. Pretties Kit pearls added to the side. You will get three of these out of one sheet of cardstock. You can either use them as a card or anotepad holder. 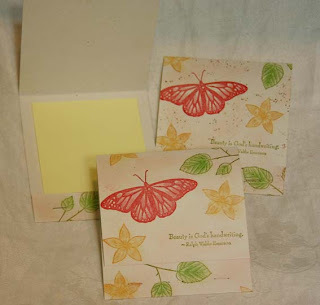 I used Stampin' Up Naturals White and cut it in 3 equal parts of 3 1/3" x 8 1/2". Score each at 1/2 and about 3 3/4". Stamp as desired. Fold & staple at 1/2" fold. 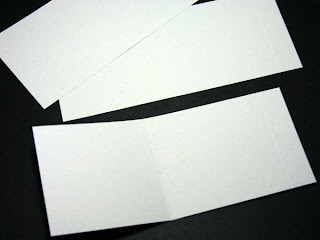 Insert Post Its and fold top edge into this matchbook style. 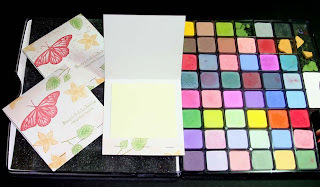 I used the new God's Beauty level 1 hostess set and shaded it with chalk pastels. You can always trim a little strip off of the edge if you don't measure exactly or staple it too high at the bottom. 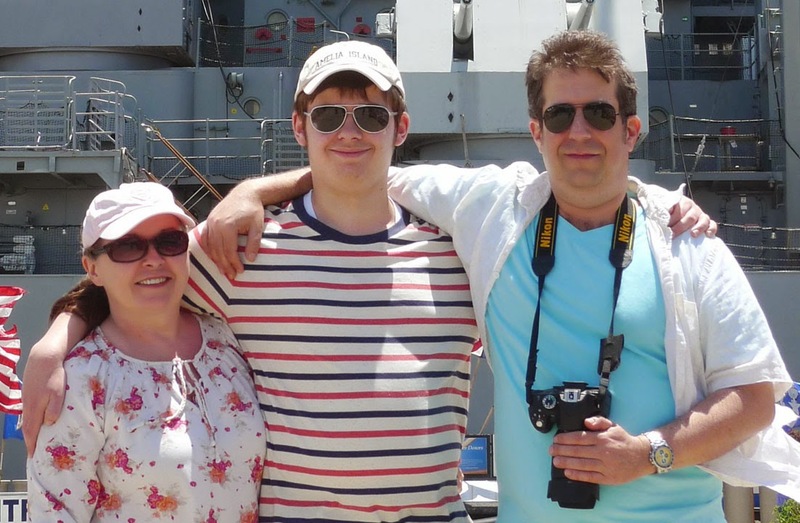 Easy as can be! This week's Doubledog Dare challenge was chosen by Anne, Itsapassion on SCS. Anne sent us some really lovely wallpaper samples to work with. You can scout out your local Home Depot, Lowe's or design centers to see if they may have some discontinued sample books that they are ready to part with. 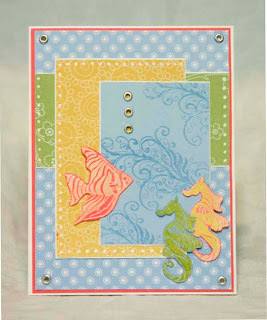 They are LOADED with cool designs that make fabulous card and scrapbooking papers. I cut out and layered the purple flower from my sample onto more of the wallpaper piece. Added some old fashioned lace and pearls. The sentiment is from SU's All Holidays. I stamped it first in Mellow Moss, lined up the sentiment with my Stamp-A-Majig and moved it over a tiny bit, stamped in Versamark and then embossed in gold (this is called shadow stamping). Card base is Naturals Ivory with Brushed Gold and Mellow Moss. 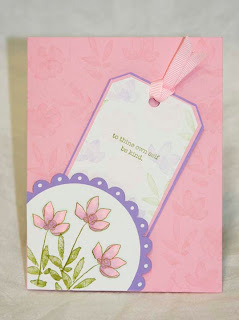 I love Kristin's beautiful line of stamps and am really looking forward to sharing some card sample ideas with you! For today's card sketch on SCS I chose Raspberry Tart paper with Rose Red, Kiwi, and Whisper White. Sentiment is from Hugs & Wishes. Kiwi Kiss ribbon, button bouquet buttons, and pearls. This is for today's color challenge to use Cameo Coral, Creamy Caramel, and Old Olive. I combined this with a challenge I do each month with my friend Anne, this month we were to use the chipboard we've been hoarding. I covered my On Board flower with Raspberry Tart paper and added Cute & Curly Best Wishes sentiment. 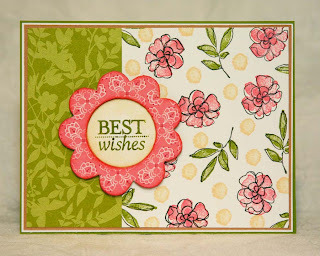 Flowers were stamped in black on Whisper White and two step stamping done in Cameo and Olive. Urban Garden paper was also used for strip at side left. 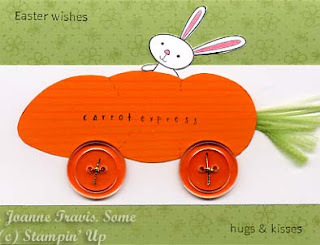 The little Apricot circle stamp is from Heartfelt Thanks. Three Amigas Weekly Challenge- "Go To Layout"
Today's challenge was hosted by Sharon Graham and it was to choose a quick layout that will work for you in a pinch. With the new Big Shot dies this is really easy, run that paper through and there's your background! I used the Urban Garden paper with the Top Note Big Shot die for this with some Kiwi Kiss ribbon, silver hardware and Soft Subtles brads. 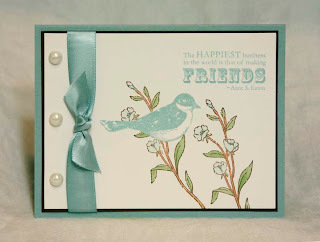 The sentiment is from A Little Birdie Told Me stamped in Kiwi Kiss ink. 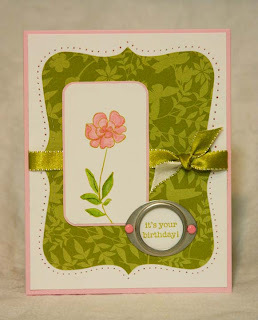 Flowers are colored with Stampin' Up markers Pretty In Pink, Old Olive, Celery, and Gable Green. We'd love to have you join us, just post TAWC in your keywords so we can find you. I came across some coasters that looked like the old fashioned cameos and thought I would try to translate it into a card. 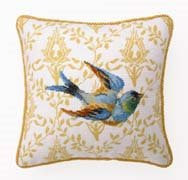 The base is Bordering Blue which was embossed in white with the Bella Toile. The vellum was folded in half over this and secured in the center under the main circle. 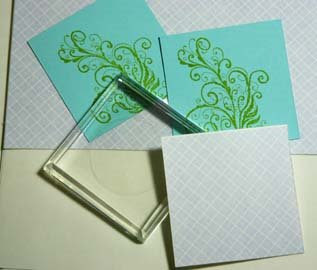 (You can add a tiny dab of vellum tape in corners if you like). 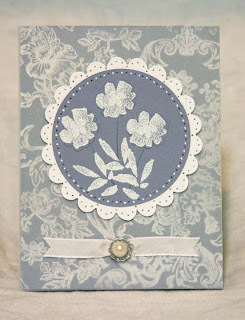 Botanical Blooms stamped first in the Bordeing Blue ink and then in Versamark and embossed in white. Add dots with white gel pen and alternating piercing. Scallop circle die is from our Big Shot die selection. Added white taffeta ribbon that was run through a ribbon slide. Center of slide ring was filled with liquid glue and Dazzling Diamonds added for some sparkle. Sale-A-Bration starts today and runs through until the end of March. 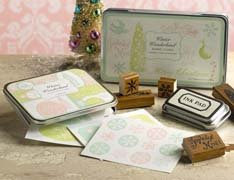 This is a fabulous opportunity to earn some free stamp sets with purchase. The choices are really excellent with a ribbon bundle and designer paper pack also added this year. I just placed a big order this morning as soon as I opened my eyes so I will be posting a ton of samples as soon as my box of goodies arrives. Stay tuned! This is a fast and fun layout with the added bonus of a removable bookmark. I always like it when you can get a little extra keepsake in addition to the card itself. I stamped the background in Pirouette Pink ink on Pretty In Pink cardstock and also added some leaf outlines in Versamark. The Lavender Lace scallop circle is from the Big Shot die and the flowers were stamped in Old Olive and the colored in with Pretty In Pink and Lavender Lace re-inkers. Scallop was taped to card on outside edges only. Bookmark (2 1/4" x 4") was stamped in same ink colors as mentioned (stamped off once for a lighter effect). Hole punch with pink grosgrain ribbon and tag corner punch used to finish.